Engineering is the art of applying science, mathematics, and creativity to solve technological problems. The accomplishments of engineering can be seen in nearly every aspect of our daily lives, from transportation to communications to entertainment to health care. Engineering follows a three-step process: analyzing a problem, designing a solution for that problem, and transforming that design solution into physical reality. Defining the problem is the first and most critical step of the problem analysis. To best find a solution, the problem must be well understood and the guidelines or design considerations for the project must be clear. For example, in the creation of a new automobile, the engineers must know if they should design for fuel economy or for brute power. Many questions like this arise in every engineering project, and they must all be answered at the very beginning of the project. When these issues are resolved, the problem must be thoroughly researched. This involves searching technical journals and closely examining solutions of similar engineering problems. The purpose of this step is twofold. First, it allows the engineer to make use of a tremendous body of work done by other engineers. Second, it ensures the engineer that the problem has not already been solved. Once the problem is well understood, the process of designing a solution begins. It typically starts with brainstorming, a technique by which members of the engineering team suggest a number of possible general approaches for the problem. Normally, one of the approaches is then selected as the primary candidate for further development. Occasionally, however, the team may elect to pursue multiple solutions to the problem. The members then compare the refined designs of these solutions, choosing the best one to pursue to completion. Once a general design or technology is selected, the work is subdivided and various team members assume specific responsibilities. In the case of the automobile, for example, mechanical engineers in the group would tackle such problems as the design of the transmission and suspension systems. Electrical engineers, on the other hand, would focus on the ignition system and the various displays and electronic gauges. In any case, each of these engineers must design one aspect that operates in harmony with every other aspect of the general design. 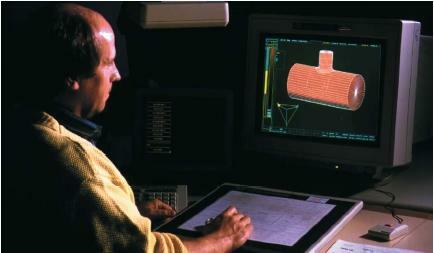 Once the design is complete, a prototype or preliminary working model is generally built. The primary function of the prototype is to demonstrate and test the operation of the device. In the prototype stage, the device undergoes extensive testing to reveal any bugs or problems with the design. Especially with complex systems, it is often difficult to predict (on paper) where problems with the design may occur. If one aspect of the system happens to fail too quickly or does not function at all, it is closely analyzed and that subsystem is redesigned and retested (both on its own and within the complete system.) This process is repeated until the entire system satisfies the design requirements. Once the prototype is in complete working order and the engineers are satisfied with its operation, the device goes into the production stage. Here, details such as appearance, ease of use, availability of materials, and safety are studied and generally result in additional final design changes. If you have the desire to move up to staisfy your quest for success, then I say move on. However, if you're doing it just for the chance to make more money, I say stay where you are.I've come to realize that, even when it comes to work, happiness is much more important than making a lot of money. Is there a way you can move to another company, but stay in the same position and make more money? If not, then definitely stay where you are for now.You're 25. Most mid-twenties people I know are either incredibly bored with what they do (like myself) or just plain hate their jobs!You're extremely lucky to have a job you enjoy so much.